georgejulian.co.uk - Ongoing open justice work: can you spare £1 a month? Ongoing open justice work: can you spare £1 a month? Still a bit shell shocked at the outcome of the HSE sentencing of Southern Health this week. You can catch up on the tweets @JusticeforLBHSE, the full judgement is available to read here and the family statement here. 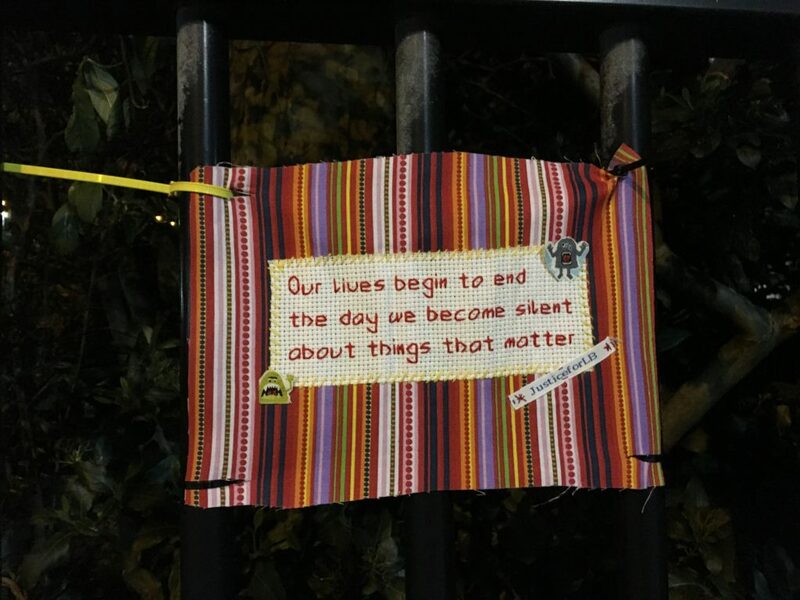 The HSE hearing was the fourth inquest or tribunal that I’ve live tweeted and as #JusticeforLB starts to wrap up I’ve been thinking about what the future might hold. I’m beyond grateful to all those people who have put their hands in their pockets and contributed financially to cover my costs to live tweet the GMC hearing @JusticeforLBGMC and to cover Richard Handley’s inquest @HandleyInquest. The money leftover from the GMC tribunals covered costs for HSE, with a small amount remaining. The amazing sum raised for Richard’s inquest allowed me to cover my costs, draw a living wage for the time I spent live tweeting and there is enough remaining to cover Danny Tozer’s inquest in a few weeks @TozerInquest. I’ve been considering funding options longer term and am hoping to secure some funding from Paul Hamlyn Foundation to enable me to spend time exploring what my options are. A few people have suggested possible funders but please do leave ideas in the comments if you can think of any who might be interested. Last week I asked five questions of the twittersphere to provide me some background information for my funding application. Is the live tweeting useful? Twitter polls only allow four options which limited the answer options on some of the questions but 259 people responded to a question about what made it useful, 8% opting for real time information, 17% exposing hidden practices, 11% raising awareness of the process and 64% all of the above. The next question asked about benefits and impact and over fifty people replied, blowing me away with the responses. You can read them all here and they probably deserve a blog post in their own right. The responses touch on a number of themes relating to shining a light in dark spaces; involving people in real time; informing people about what to expect if they themselves are awaiting an inquest; connecting people to a cause that is important to them; enabling people to offer support to families by witnessing; complementing or replacing local court reporting; reminding professionals what they look like and/or providing opportunities for reflection; enabling people around the globe to follow what is happening from Australia, New Zealand and Finland; and perhaps most importantly the idea that it provides support to families and that ultimately it will lead to an erosion of the dirty tricks at play. My fourth and fifth questions touched on funding and whether people might be interested in supporting my ongoing campaigning work with a regular donation. I’ll be totally honest I think I played my cards wrong on this one, I went big with £5, £10 and £20 per month, whereas a larger number of people supporting by £1 a month would be just as good, and arguably even better. The response was amazing. The poll finished today and a number of people have sent me messages already asking where they can sign up to donate dosh. I’m going to be honest I’m deeply uncomfortable, despite the amazing feedback, to be asking for financial support but I’m channelling my inner Amanda Palmer and embracing the Art of Asking. I’ve also heard loud and clear that for some people funding my open justice work on an ongoing basis presents an opportunity to maintain a connection to this work. A number of people have said that they would not be able to make a regular contribution but would still welcome the chance to contribute occasionally. So here’s the plan. I’ve been advised not to put my bank account details online but I’m happy to share them with people by email. If you are happy to make a donation then please click here to send me an email with your name, the amount you’d like to donate each month [anything from a £1 a month would be very gratefully received] and your preferred donation method [bank account or paypal] and I will send you the details you need to set up a regular payment. If you’d like to make a one off donation at any time then please feel free to drop me an email to let me know and request information. I’m going to keep looking for external funding, but for now I’m humbled that so many people would like to keep funding my open justice work. Any money I raise would be used to pay me for my time doing open justice campaigning. The sorts of things that includes is providing support and advice to bereaved families; blogging and sharing information publicly; presenting key messages when invited to speak at conferences or meetings (something I’ve never been able to afford to do before and won’t intend to do much of). What I’d really love to do is explore the latent value in the tweet archives and take some time to look at Richard’s inquest and digest the key messages from it, using it as a case study to consider how to make a more accessible and useful summary. I may also use small amounts of money to buy craft supplies for awareness raising prompts. When it comes to attending inquests, tribunals and pre-inquest review hearings to live tweet proceedings these invariably have considerable costs for travel and accommodation etc so the number I am able to do will depend on the amount raised and the success of applying to external funders. I would like to be able to continue to shine a spotlight on citizens being failed by state services, especially those who are learning disabled or have mental ill health. As a freelancer any income I earn will be taxable (obviously) and I am not offering rewards for donations, because then it turns into a trading relationship. You will all have my undying gratitude though. As you’re all aware I’m big into transparency so I’ll also provide a breakdown of donations given (the numbers, not the people) and how they are spent at least once a year, more often if people would like. If you’ve got any questions then please just shout, and if you’d like to make a regular donation please do get in touch and let me know so I can send you my details. Many, many thanks for all the encouragement and support, I’ll be eternally grateful that only 3% of people told me to get on my bike at such an outrageous request. Thank you for your very important work. I’ve contacted you via email.